One nun and two cats moved to the new Sravasti Abbey in October 2003. Many dreams and plans went before it, and much effort has followed. That’s when our history begins. Sravasti Abbey supports a flourishing monastic community where learning and practicing Buddha’s ancient teachings cultivate peace in the hearts of residents, visitors, and the world. We seek to preserve Buddha’s teachings purely, to root them deeply in Western soil, to share them with others, to build an enduring sangha, and to serve sentient beings for as long as space remains. Ven. 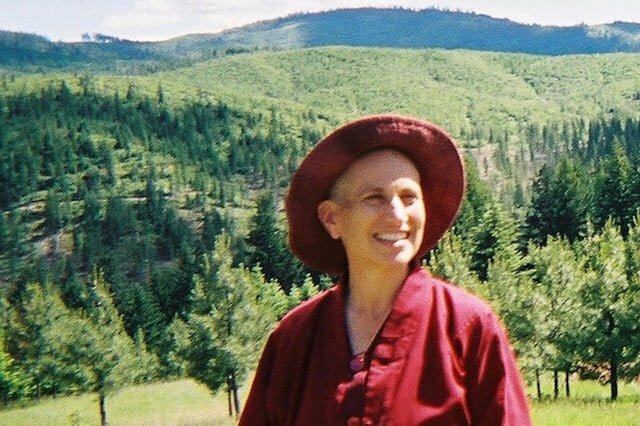 Thubten Chodron, a Buddhist nun since 1977, dreamed of creating a monastic community in the US for many years. With the blessing of His Holiness the Dalai Lama and the advice of many of her teachers and senior monastics of several Buddhist traditions, she founded Sravasti Abbey in 2003. The seeds for Sravasti Abbey were planted in 1993 at a Western Buddhist Teachers’ Conference with His Holiness the Dalai Lama. There, Ven. Thubten Chodron and other Western monastics shared openly about the difficulties that they faced in the West, where there is little understanding and support for Buddhist monks and nuns. By the end of Jetsunma Tenzin Palmo’s presentation, His Holiness the Dalai Lama wept. He told the Western monastics not to wait for the Tibetans to provide for them, but to go ahead and start their own monasteries. There’s a video of their historic meeting. This was a turning point for Ven. Chodron and her dream of developing a Buddhist monastic community. His Holiness the Dalai Lama’s words gave Ven. Chodron the confidence to work towards creating a community where Western monks and nuns could live and practice together, without having to worry about obtaining the four requisites of food, clothing, shelter, and medicine. With a name from His Holiness the Dalai Lama, there was no turning back. After a false start in Missouri, Ven. 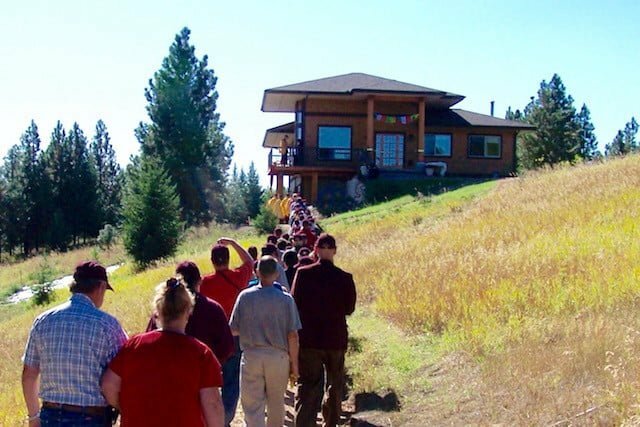 Chodron’s Dharma students in Idaho began helping her to search for land nearby to build a monastery. After attempts to found Sravasti Abbey in Missouri and Idaho, Ven. Chodron first viewed the 240 acre property near Newport, Washington in August of 2003. Within a few months, the purchase was made and Ven. Chodron moved in with her two cats, Manjushri and Acala. Some of Ven. Chodrons’ students from Seattle, where she had been the spiritual advisor to the Dharma Friendship Foundation for 10 years, formed the Friends of Sravasti Abbey (FOSA) to support the Abbey’s development. Ven. Chodron had articulated the key principles that would steer the Abbey’s course for residents and guests to develop a Monastic’s Mind. Over numerous meetings, the FOSA drew up operating systems that are still in progress. Many of the core members eventually moved to the Abbey. Some of them ordained as monastics and dedicated their lives to develop the Abbey and the Dharma in the West. Over the years, the Sravasti Abbey community has grown steadily, necessitating the construction of more buildings to house an increasing number of residents and guests. We celebrated our 10th anniversary in 2013 with the consecration of Chenrezig Hall, which has a commercial kitchen and more rooms for guests, and recently purchased Tara’s Refuge, which will serve as a buffer for the Abbey’s future growth. Join us in creating the causes for the Dharma to continue to flourish in the West, to create peace in a chaotic world. Property with large house, barn, and outbuildings is found and purchased • Previous owners carry the mortgage • Friends of Sravasti Abbey is founded to support the Abbey’s development • Ven. Chodron moves in October 17. See 2003 photos. First monastics visit • First lay resident arrives • Khensur Wangdak Rinpoche blesses the land • First annual open house for the broader community • Volunteers finish the basement of the existing house for more guest housing • Two-car garage is converted into a Meditation Hall. See 2004 photos. Lama Zopa Rinpoche blesses the land and gives the Vajrasattva initiation • First annual winter 3-month retreat begins • Students construct a Writing Studio for Ven. 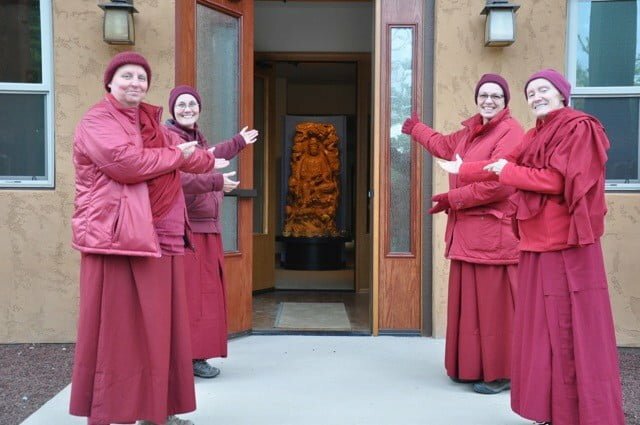 Chodron’s work and remodel a wing of the barn into a Community Room for more guest housing • More lay residents arrive • First annual Exploring Monastic Life program. See 2005 photos. More lamas visit and teach, including the current Jangtse Choje Rinpoche, Panchen Otrul Rinpoche, Khensur Wangdak Rinpoche, and Khensur Jampa Tegchog Rinpoche • Abbey hosts first annual Young Adults Explore Buddhism week • Volunteers remodel the existing house loft to create more housing for residents and guests • First nun is ordained at the Abbey • With gifts from all over the world, we pay off the mortgage. See 2006 photos. More lay residents arrive • More retreats are offered, and more guest teachers come • The Abbey hosts the Heart Shrine Relic Tour in Spokane • The Aspiration Buddha is enshrined in the garden • We see a second ordination • Plans begin to construct a nuns’ residence. See 2007 photos. More residents, more guests, more programs, more ordinations • Residents remodel the existing house—now called Ananda Hall—to expand kitchen and dining facilities • We break ground to build the nuns’s residence, Gotami House • The Abbey celebrates its 5th birthday • The first Abbey nun receives full ordination. See 2008 photos. More residents, more ordinations, more programs, more guests, and more guest teachers, including Geshe Lhundup Sopa • Geshe Sopa and Khensur Wangdak Rinpoche bless the new building • Stained-glass window of Mahaprajapati Gotami, the first Buddhist nun, installed in Gotami House • Nuns move into Gotami House • The Abbey gets a new sign and a huge crowd of friends and donors come to consecrate Gotami House. See 2009 photos. 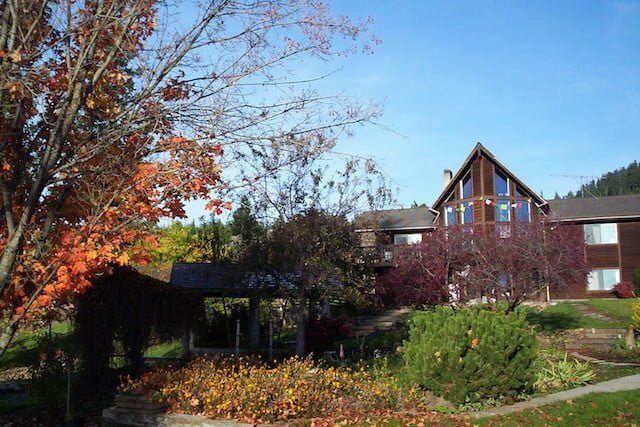 More residents, ordinations, retreats, and guest teachers • Continued annual programs • We build and consecrate Shanti Cabin, a retreat cabin and housing for guest teachers, and hold a long-life puja for our abbess. See 2010 photos. The community, Dharma programs, and numbers of guests continue to grow • We begin plans to build Chenrezig Hall: new dining, kitchen, guest space, and other facilities • The community travels to Washington, D.C. to take teachings with His Holiness the Dalai Lama • We host the Heart Shrine Relic Tour for a second time • With five fully ordained nuns, we begin to conduct the twice-monthly ceremony of confession and restoration of precepts, posadha • To make way for Chenrezig Hall, we move the Meditation Hall 300 feet up the hill. See 2011 photos. The community grows and we break ground to build Chenrezig Hall • Dagmo Kusho Sakya is among our guest teachers • A ceremonial day consecrates the land for Chenrezig Hall construction and celebrates Ven. 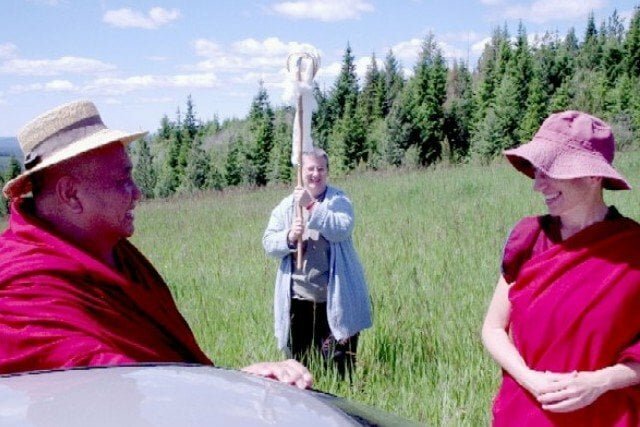 Thubten Chodron’s 35 years of ordained life. See 2012 photos. The sounds of construction permeate all that we do • Guests continue to come and we ordain two more nuns • Beautiful statues and paintings of holy beings come to live in Chenrezig Hall • Dagri Rinpoche and Geshe Yeshe Thabkhe are among our guest teachers • Both conduct ceremonies to bring auspiciousness to the new building • In November, it is nearly complete and the community moves into Chenrezig Hall. See 2013 photos. Guided by senior Taiwanese nuns, we learn the ceremonies and begin the Abbey’s first varsa, an annual monastic retreat • With varsa and the accompanying end-of-retreat-ceremony called pravarana, we now engage in the three rites of a fully functioning sangha community • In June, we officially consecrate Chenrezig Hall with over 80 friends in attendance, including a large contingent of Singaporean friends • Ven. Chodron has been publishing books all along, but this year’s release is special: Buddhism: One Teacher, Many Traditions is co-authored with His Holiness the Dalai Lama. See 2014 photos. The schedule is full with Dharma programs • Ven. Chodron continues to teach around the world and Abbey nuns travel to teach as well • A monk ordains to join our community of nuns • A magnificent stained-glass depiction of Chenrezig, Buddha of Compassion, is installed in the dining room • The Abbey hosts the 21st Annual Western Buddhist Gathering • We buy an adjacent 60-acre property that we name Tara’s Refuge. See 2015 photos. The community continues to grow • Attendance for Sharing the Dharma Days and retreats breaks records • We work in the forest and focus on rehabilitating the buildings and meadows at Tara’s Refuge • Geshe Yeshe Thabkhe teaches Aryadeva’s 400 Stanzas via the Internet and Geshe Dadul Namgyal teaches Madhyamaka philosophy • Another nun joins the community • Ven Chodron receives a Global Bhikkhuni Award from the Chinese Buddhist Bhikkhuni Association of Taiwan • See 2016 photos.